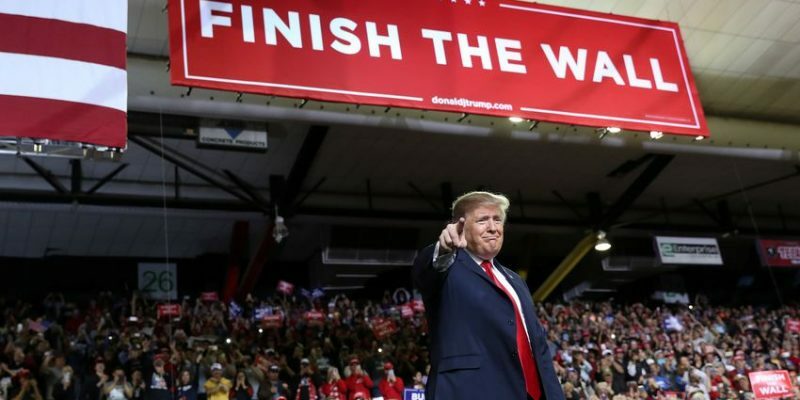 (El Paso, Texas) – President Donald Trump held a rally yesterday just miles from the US-Mexico Border with estimates that up to 35,000 supporters were in attendance. The President was warmly welcomed by a packed house in as he walked out to the popular song “God Bless the USA”. Trump recognized and thanked Texas Governor Greg Abbott, Lt. Governor Dan Patrick and US Senator Ted Cruz. A giant American flag graced the stage as usual but instead of “promises made promises kept”, both sides of the flag read “FINISH THE WALL”. “America is winning again, isn’t that nice?” he asked the cheering crowd. “So we have, let’s say, 35,000 people tonight,” the president said. “And he has 200 people, 300 people. Not too good.. In fact, what I would do is say, ‘That may be the end of his presidential bid’, But he did challenge us.” Trump said. Politico claims that O’Rourke had up to 7 or 8 thousand. He should have, he’s from El Paso after all. The former city councilman is still being considered a potential presidential candidate. Most analysts agree that this was, for all intents and purposes, President Trump’s re-election kickoff rally followed by another one in Florida.